for which the scale bar represents 75, not 100 microns. Figs. 1, 2. Possible hybrids between Dictyocoryne and Rhopalastrum. BSS 150(F) EF S35 and BSS 54(F). Figs. 3-5, 8. Dictyocoryne abyssorum. BSS 26(F) EF J51, IOW 188(F), BSW 05(F) EF W40, BSW 32(F)(>125 um) EF 031. Figs. 4 and 5 are less developed ("younger") than the other two. See also the previous plate (figs. 1 and 6). Figs. 6, 7, 9, 10-13. Dictyocoryne truncatum, all forma echinata except fig. 11. Figs. 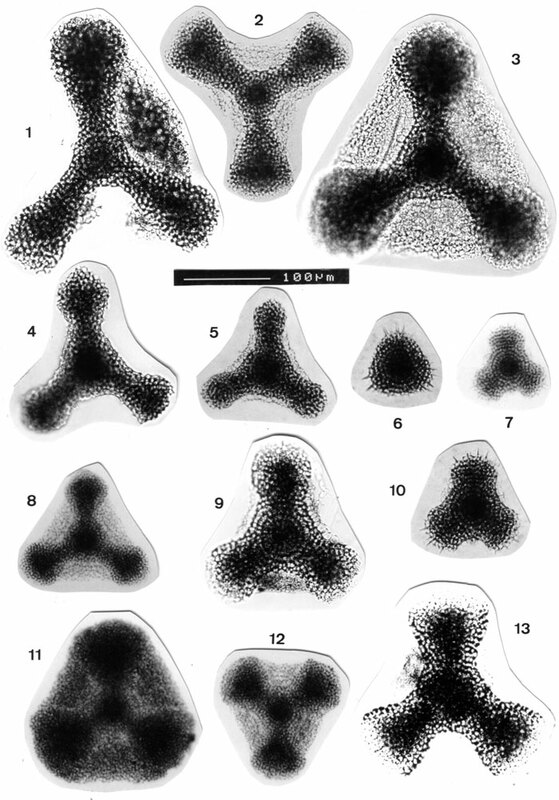 6, 7 and 10 are juveniles; the specimens of figs. 9 and 13 show evidence of dissolution. Figs. 11 and 12 show a well-developed and incipient patagium resp.. BSW 03(F) EF U26, BSW (no sample ID), Euchitonia-prep. nr. 21, BSW 3(F) EF M35; BSW 51(F) EF and C44, BSW 51(F) and BSS 30B(F) EF 033.